Well, to follow the theme from yesterday. All of my girl scout cookies are gone and none to be had within miles. 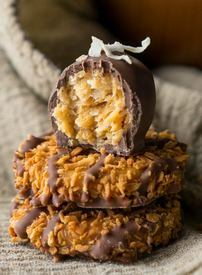 These truffles have All the chewy caramel and coconut flavor from a Samoa cookie wrapped up in a thick layer of chocolate! Bonus – it’s only 4 ingredients! !